The Copyright of this document belongs to John Horsey, County Philatelic Auctions © 2000. When Britain changed to decimal currency in 1971, definitive stamps on the new currency were issued in sheets, booklets and coils. As part of an attempt to overcome production problems with booklets a roulette was used. 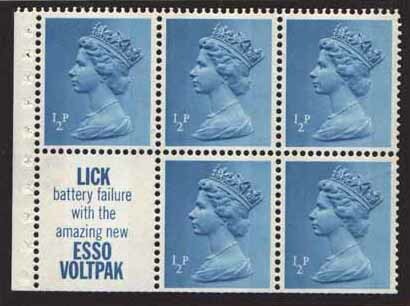 A very few stamps exist with one edge rouletted instead of perforated. These booklets were made up from special format single or double ‘primary’ sheets. These comprised 20 rows of stamps and 4 (or 8) columns of panes wide making a total of 40 (or 80) booklet pane images. Columns 2 and 4 were inverted so that pairs of columns were tête-bêche in the uncut primary sheet. A gutter between columns 2 and 3 formed the selvedge of the inner panes. Booklets were made by combining these primary sheets with similar format sheets of covers and interleaves to form a sandwich and stitching the whole together along the pane selvedge’s. The mass was then cut into the 40 individual booklets. Just like normal sheets of stamp, these booklet primary sheets had top and bottom margins. 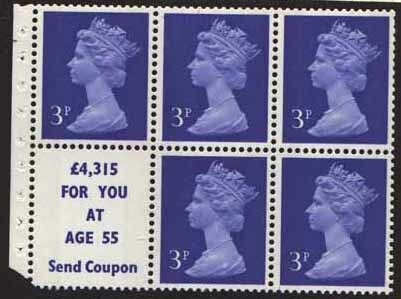 These had to be removed to achieve a clean well defined edge at the bottom (or top) of the primary sheets so that the stamps could be correctly aligned (vertically) in the interleaves and covers sandwich. Horizontal alignment needed similar consideration. This had not been a problem in £sd days as the 21 row cylinders generally used printed a continuous web and there was no top/bottom margin to remove. The web could automatically be burst into sheets of 20 rows. However, continuous web could not be used with the decimal panes of 5 stamps without the labels appearing at the top on some panes and at the bottom on others. The problem had been encountered on a smaller scale with the occasional 20 row cylinder (panes of 3x 1d Wilding plus 3 labels) many years before. But now, compared with the immediately preceding £sd books, these margins were having to be removed manually for the entire booklet production runs of the period. The printers had to look for ways to reduce this effort in removing the margins. This eventually led to the well understood development of a variety perforator combs. It is the problems encountered in the early days of this process that led to experiments including the rare use of roulette cutters. Well established was the use of the ½V cut, Fig 1. To give a good lead into the bottom perforations along which the tear is to be made, groups of primary sheets had a V-cut clipped through the side margin up to the perfs (using something like a railway ticket clipper). The margin could then be torn off leaving the ½V cut as seen above. Removal of these margins being a manual process was time consuming. It probably resulted in many sheets not tearing cleanly and being wasted. As anyone who has removed margins from normal counter sheet will know, they do not always tear along the perforations. Folding along the perforations will weaken them to ensure the sheet tears where it should but folding is time consuming. An alternative that offers less resistance than perforations is a roulette. The pane in Fig 2 and its enlargement Fig 3 show evidence of a rouletted lower edge. This pane and another like it were found by the author in a large batch of 1971 50p booklets. Interestingly the lower margin of this pane is just sufficiently wide to indicate absence of normal perforations on this edge. When this pane is overlaid with a normal pane it shows there should be just a trace of perf dents. There are no such dents in Fig 3 but the roulette effect is clear. Arguably the absence of perf traces could be a slight misalignment of the perf comb making a taller than normal pane but with the lowers perfs trimmed off. Similarly, the roulette effect could be just an effect of the guillotine when separating booklets in the sandwich with a slightly blunt cutter. However, the other 2 panes of this booklet were normal. They had full perfs along that edge and neither they nor the covers or interleaves showed any similar roulette effect. While indicative of roulette, this is perhaps not sufficient to be conclusive. However, the author found one further pane, Fig 4, in the similar large batch of 25p booklets. This is far more conclusive proof of roulette. This time it is the 2½p ‘Stick firmly’ pane. This pane position is the top right pane (inverted) in the primary sheet. Note the part missing selvedge, exactly as found in the booklet, is indicative of the difficulties encountered removing the margins of the primary sheets cleanly. But even more important, as shown in the enlargement Fig 5, there is clearly the use of a square roulette type cutter in addition to the normal perforations. This time the booklet was from sheet edge. The covers overlapped the pane slightly and there is no possibility of this being any effect of the guillotine. Use of such a cutter would weaken the perfs substantially and assist clean removal of the top margin. The author believes this to be conclusive proof of the experimental use of a roulette style of cutter to aid removal of the top or bottom margins from the primary sheets. The experiments may have been carried out on a few sheets only. 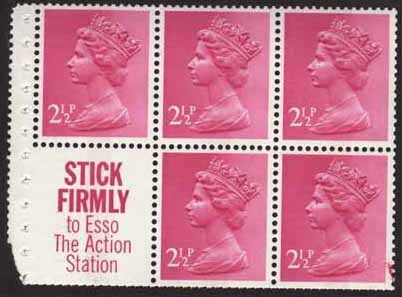 In theory there should be new catalogue entries of ‘roulette one edge’ for these ½p and 2½p stamps. The author carried out a detailed study of the early decimal booklets in 1971 and this research dates from that time. His extensive collection of panes from these booklets is now sadly dormant as running County Philatelic Auctions (see http://www.stampauctions.co.uk) is a very full time occupation. On the basis it has taken nearly 30 years to find time to document these remarkable findings it may be another 30 years before further research is written up!